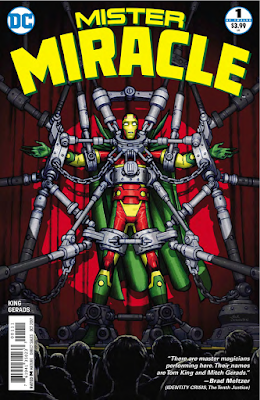 Having some knowledge of the character, this title is a great continuation of Mister Miracle’s life. Scott’s view of life as mundane and boring as he can escape anything really caught up to him -- so much so he attempts suicide. In a talk show interview, he tried to explain this act as an escape act attempt to escape death as he can escape anything else. He needed to one-up himself but I’m not entirely convinced that was the true reason. That was probably the reason for his fans so he doesn’t worry them but I really think his depression caught up to him. This issue is such a deep character look into a character that isn’t too well known. 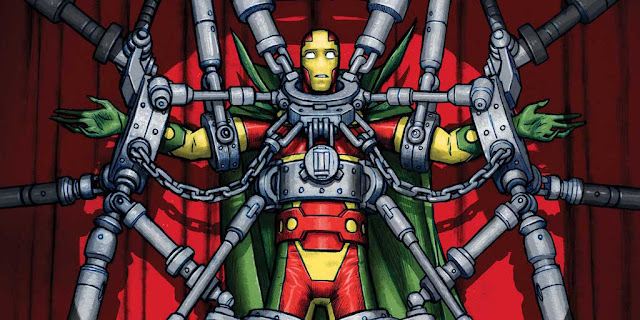 An entertaining escape artist who wears a brightly colored costume and always seems to have a smile on his face isn’t all there, unfortunately, and I really enjoyed that aspect of this issue. Scott thinking his now dead assistant Oberon was still with him was truly heart wrenching. It seems he absolutely misses him so much that he’s hallucinating he’s there or there’s something mentally wrong with him. I would love to learn more of what is wrong with Scott and why he’s feeling this way. A great question was asked by the talk show host, “did you really escape death?” After all, Scott was found by his wife Barda. If she hadn’t found him, he probably would have completely bleed out from him cutting his wrists and thus failing his escape act. Mister Miracle doesn’t answer this question which leads me to believe he didn’t intend this to be just an act. The art is wonderful as well -- it has such a classic look to it but still has a modern feel, perfect for this book. I also get a Young Animal vibe with this book but it’s so great to have it be a main DC title. Panels are simple yet brilliantly placed and it is very fun to read through. 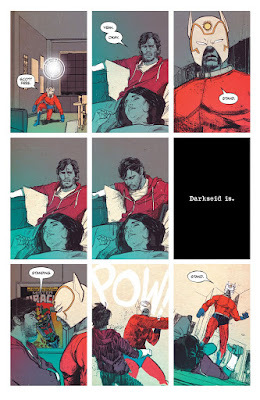 Mister Miracle #1 is a brilliantly crafted issue that brings back a classic character in such a smart way. The character examination of Scott is so deep and emotional. The potential this book brings has me excited to see what happens next and I can’t wait to see the eventual meet up with Darkseid.